When Hurricane Sandy headed for the East Coast last year, it couldn’t have been recognized that it would become the deadliest and most destructive hurricane of 2012, as well as the second-costliest hurricane in United States history. From Florida to Maine, the US suffered extensive damage; with the Jersey and New York shorelines getting hit the worst. Many months later the destruction remains. Danger zones, damaged homes and destroyed boardwalks make it hard for people to rebuild their lives and get back in their homes. 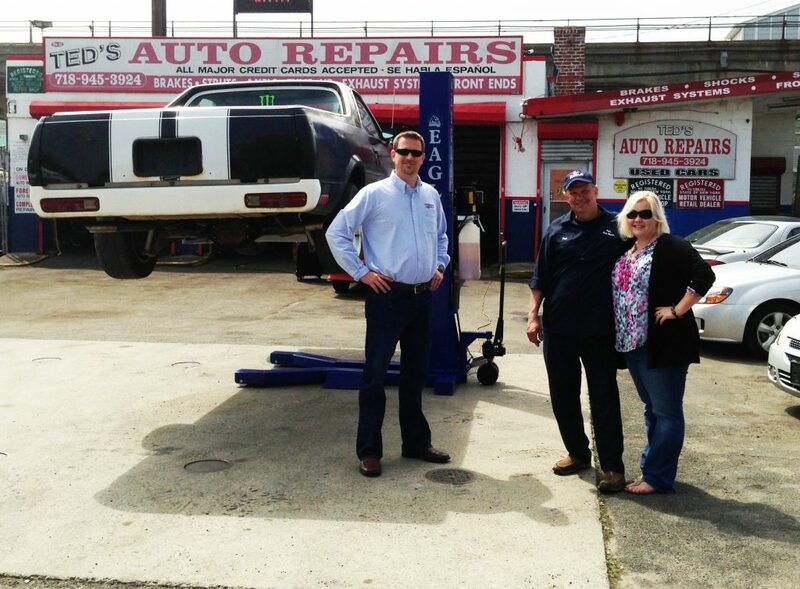 Eagle Equipment was honored to help one New York resident start to rebuild his business. Producers of the hit FOX show, Extra!, called Eagle Equipment, of North Carolina, in for help when they were doing a story to help rebuild Ted Linder and his family’s life. See the clip from Extra! Ted Linder and his family had extensive water damage to their Rockaway Beach, NY Home as well as his business, Ted’s Auto Repairs, which he has owned for several years. Sam Champion, of Good Morning America, showed up with the crew at Extra! to fix up his home is just a week’s time, thanks to Paul J. Scariano, Inc. who completed all the construction. His business suffered a lot of damage, included his ability to preform many car repairs because he was unable to use his car lift, which had become corroded and rusty from the water damage. Eagle Equipment sent him the Mobile Man lift, one of their most popular lifts, because of its ability to do many jobs. “We choose to give Mr. Linder the Eagle Mobile Man lift because of its versatility. It can handle up to 6,600 lbs, can be moved to any part of his shop easily, and allows him to adapt for many different kinds of jobs, allowing him to grow his business,” says Eagle Equipment CEO, Michael Kestler. Other contributors included The JW Marriott, who gave the Linder family a vacation as well as Ivanka Trump and Macy’s, who stepped up to help rebuild the daughter’s wardrobe. Previous Previous post: WHAT IS THE BEST OIL FOR MY EAGLE LIFT?